My mom passed in January. She'd been sick for a long time and while her passing was not at all unexpected, it was still jarring. As death most often is. My husband had spent years telling me to be prepared. He wanted to protect me, knowing how close my mom and I were. But as hard as I tried, I couldn't face the idea of losing her and I certainly didn't want to think about it until I had to. The truth is I'd been grieving for years. My mother's decline was slow. The losses came in waves. First it was her ability to drive and live alone, then her ability to walk and move her limbs freely and finally, in an especially cruel twist, she lost the ability speak. I grieved for our old relationship and the mother I used to know, but it wasn't true grief. After all, I still had her. Here. I could hug her, visit her and hold her hand. I could cry to her, watch old movies with her, shop for her, talk to her, care for her and love her. In person and in the flesh. Now all I can do is miss her. And I do. So much so that in those first few days I cried until I couldn't breathe. Sure, I held it together as the capable hostess, serving dinner to forty in my tiny home in place of a traditional wake. I comforted my grown nephew as he cried on my shoulder at the church. I stood strong and dry-eyed, freezing at the gravesite. My mom would've been proud of me, I know. But all the while my heart was broken inside, irreparably cracked. And of course, it still is. In time, it will heal some, but having lost my dad so many years ago and a baby to a miscarriage not so many years ago, I know the drill. Like a broken vase, they'll always be missing pieces. Pieces you sweep up, but just can't bear to throw away, even though you know they'll never fit back into place the same way ever again. And just like that cracked vase, unless you point them out, the fissures go unnoticed by most. Ten months later, I still move rather slow. I smile and laugh often, but the tears are always at the ready with the proper provocation. And exactly what that is, I never know. There are the predictable triggers...songs, places, photos, commercials. Then there are the ones that seem to come out of the blue. A smell, a recipe. The sight of someone else with their mom. If I'm alone, I let the tears flow. I give in to the sadness and feel. If I'm with friends or even my family however, I stuff it. Grin and bear it, smile and converse. There may be a heaviness in my chest, but I don't skip a visible beat. It's not that I think the people around me don't care, I know they do. I'm surrounded by wonderful friends, they just don't recognize the subtle signs. Or don't want to. Grief makes people uncomfortable, especially when it's displayed after the funeral or wake. So with the one year anniversary of my mom's passing on the horizon, a woman who was very sick, a hair shy of 87 years old with three generations who loved her, the assumption is that I, a grown woman of 50 should be fine by now. Right? But I'm not. She was after all, my mom. Some days, I sleep more. Some days I cry. Some days I'm not hungry and on others I only want chocolate cake. Some nights I watch the clock with no possibility of sleep. Some I dream and wake up shattered all over again. There are days I can't think of anything else...and days when I barely go down that road. But most people don't know any of this, because they stopped asking months ago. I guess they think I'm done, as if there's a clock on sadness. So the days pass and I eat and cry and think and miss and hurt in silence. A quiet place that finds me missing my dad immensely now, as well...a man who passed away 38 years ago. A testament to the fact that grief is a never-ending process. Of course, acceptance will come. That raw searing pain will fade and I'll stop eating so much chocolate cake. That will be with me. Forever. The loss of my mother in 1980 was one of the most crushing experiences of my life. Now at seventy-one, I still miss her. This post is so well written and heartfelt. Some folks seem to think there is an expiration date on grief. I hope you have a special someone who will understand that just because time has passed and the pain has lessened, you still need to talk about your mom and your loss. Donna, I am so sorry for you loss. I lost my dad in 1980 and it still burns, so I know exactly what you mean. I do have wonderful people around me, thank you, because yes, we do need to talk...thanks so much for sharing your thoughts. It means a lot…and thank you for being patient with my response. As you can imagine these comments are not easy to answer. It’s an emotional process and they are all so heartfelt and I want to give each one the time and thoughtful response it deserves. Oh Jane, I am so sorry. I know we both went through this at the same time, the wound is still so fresh and painful. Your comment describes exactly how I feel in exact detail. My moms age, how it still wasn’t enough time, how I want to call her and go to do so…I wish you peace as you move toward the anniversary date and through this first holiday season. Know that I will be thinking of you, my friend and sending you the same prayers and wishes for a healing heart. I think I can see grief . . . I know I can feel grief as well . . .
Not my own . . . as much as in another . . . Yet, saying that, I missed it in you. Oh I knew your mom died. We talked a bit about her dying and then when she died, we talked a bit more . . . But I have been amiss . . .
Not seeing, hearing, feeling . . . your grief . . . until I read this a minute ago. And now I want to fold, hold you . . . in to my heart . . . I needed to hear you say . . . that you “wear the face” that all is well, but alone . . . the tears fall, again and again . . .
your grief, and one I had not been seeing/feeling . . . I find that grief channels into new roads . . .
like there is your road, yet I am leaping over into my own road . . . right now in fact . . . It reminds me of my mom, in a way, when her “essence” was gone, months, years, before her death. but I could still touch her, hold her hand, brush her hair. I was grieving all along the way . . . and then her death . . . and then the grief became brand new. Interesting as I write this . . . it is at the time of the year when my late husband died . . . I find that I want people to know about him, because he was part of me . . .
and I want people to know that now, even more so, for my now grown children. He was their DAD . . . like YOU KIM . . . and then gone in an instant . . .
You do know what that was like! This year I found some old pictures . . . and posted them . . . and in a way now . . . I wonder what others think, when I do that. I guess it is kind of like a “memory picture wake” . . . and like a “wake” there is some discomfort for the people who visit maybe. Oh, dear, rambling here . . . I guess your, “Can we see grief?” has been a very good question for me. Holding you Kim . . .
Hi Kim, it is so hard to deal with grief. It does get better with time. The best thing is you will have good memories of your mom. Staying busy really helps to get through what you are dealing with. Take care and have a nice weekend. I am so sorry for your loss - I know and I share in your grief as many do ...... my Dad passed away two days before my high school graduation from a brain tumor and my Mom 6 years ago at the age of 88. I miss both everyday but I also carry them with me in my heart, memories and mostly what they taught me and how I have passed that to my boys. On my wedding day - my dad even though he wasn't next to me as I took those steps, he was with me with every one - my Mom is in the recipes of hers I make and the sewing, crafts we enjoyed together. I hope for you the best. Thank you for sharing your story with us and thank you for your kind words. I am so sorry for your losses, losing a dad when you're young is hard. I know. Like you, I try to keep my parents with me when I can...my dad in my heart on my own wedding day and like you, my mom's recipes have taken on a special meaning. I think it's important that we find ways to focus on the good memories. It does help the grief...I wish you the best as well...thanks again for the very thoughtful comment. Kim this is so touching and how elegantly you spoke of your grief. 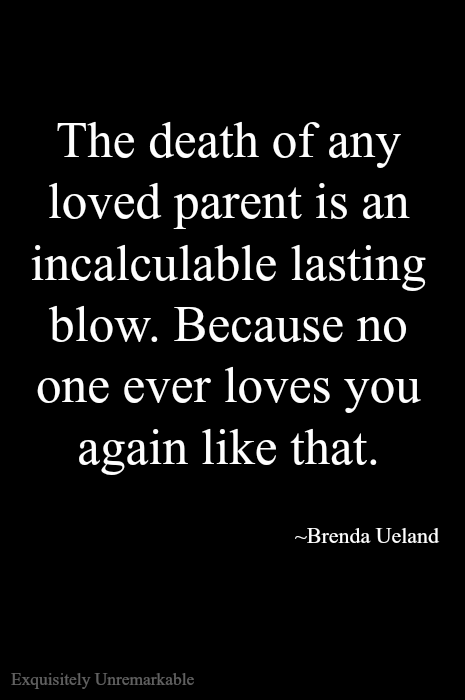 Even though we all know death is part of life it still is hard when we lose a loved one especially a parent. Brenda Ueland said it beautifully no one will ever love you like they did. 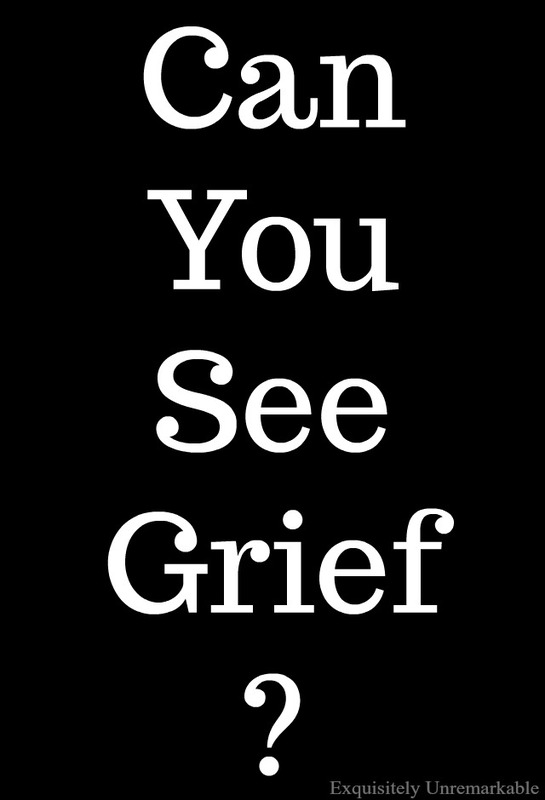 Grief is so different for each of us and everyone needs to grieve in their own time. I always have felt that time does not make the grief and sadness of loss go away but it does seem to make the days more tolerable. I wish that for you. The first's after each loss are always the hardest too. The first Thanksgiving or Christmas, birthday are always the hard. The one year anniversary is hard because it is the beginning of measuring the time since the loss. You are doing so well to be able to speak of your grief and let it continue when needed. You are a good daughter and I know your mom is smiling down on you and wanting to hug and wipe away your tears when you need it. Hugs sweet friend. This was so beautifully written. My mom passed away very unexpectedly three years ago next week and that ache and pain of loss is still with me. The first year was the most difficult and the pain does subside somewhat, but it never goes entirely away. ((hugs) to you. Of course you're not over it. You will never be over it. You know after losing Abi I've written about grief a number of times in the past 5 months. People want you to move on, to get past the grief. I never had parents, but I know what it is to lose a beloved pet, which to me I guess is the same as people. Please don't feel you have to hide it. It is so natural to grief. No matter how long ago it was. Thank you, Brenda. I know your heart has been broken by the loss of Abi. No, there really is no getting over it....but I guess that's just a testament to how much we loved. Thank you, Ricki. Writing and sharing in words does help. Thanks for taking the time to read the post and respond. It means a lot and the comments people have shared, are very comforting. Kim, with such beautiful words, you've expressed the deepest feelings that so many of us experience. I must tell you that over time, the grief does soften, but the memorable tears will remain. It can't be helped, and even after thirty five years, I am glad for the tears, as it reminds me still, of how wonderful my mom was. yes. it does come in waves. and just like the sea … I imagine it will be endless as long as we're here. I used to suppress the feelings of grief. and I know now that is dangerous. but I had to work. and somehow I could feel people's impatience? so I clamped down. first daddy then mother then husband. I never learned to really be able to feel it or even show it. because as you say… it made people uncomfortable. our society doesn't seem to handle death very well. there are always such time lines. writing like yours in this post is good and helpful. and somehow comforting to those of us who share it with you. and it's needed. bless you Kim. Kim, yes, you can see grief. I saw it every time I looked at myself in the mirror after my first husband left me and our little boy. Left us alone with just a goodbye note on the kitchen table. I was a school teacher and every time I went to the restroom at school, I'd catch a glimpse of my face in the mirror as I washed my hands. I would be startled and ask myself, "Who is this sad, broken woman looking at me?" Then, I would realize that it was my own reflection. I sunk into depression and anxiety along with my broken heart. Yes, a heart can break. I couldn't eat, couldn't sleep, lost 40 lbs, developed an irregular heart beat. My kind Dr. put me on life saving anti-anxiety and depression meds. for several months. I had to put on a smile, go teach school all day. I couldn't break down and lose my job. Still, we didn't have enough money to live on, so I had to start a tutoring business in the afternoons, Saturdays, and all summer. Still not enough money, so I also had to go to graduate school in my "spare time" to get a masters degree so I could make a little more money. (I was 40 years old.) I drove 45 min. to the nearest university and took courses at night for 2 years. Hey, my nights were free, huh? I took graduate courses all summer for 2 summers and continued my tutoring business when I wasn't in class. My son went with me to the university, because there was no one to keep him. He says he "grew up at the university". The students and professors loved him and he enjoyed it. With God's help, we made it through 7 very touch years, and then I met and married my "precious angel husband". I can laugh and say I'm so glad the first husband left! Just wish he had left sooner! My son got a full college scholarship and research paid for his graduate school! What a blessing! My Mom died at age 92, six years ago and of course I still miss her. At times the grief would wash over me in waves of despair. Now, I find comfort in remembering all the wonderful life lessons that she taught me. When I get discouraged, I can imagine my mother telling me, "Dry those tears, go to the kitchen and cook your husband a wonderful dinner!!" "Do some cleaning, work on your crafts and sewing. Remember that I raised you to be an independent, strong woman.!!" I'm 71 now and a grandmother and every day, I whisper, "Thanks, Mom. You raised me right and I love you. See you soon." God bless you, Kim. I'm praying for your grief. God loves you. Oh, Kim...this made me cry. You expressed your feelings of grief so well. I thank you for being so open and and raw with us. I can't say I understand, because I still have my mother. However, as you know, I have lost firstborn son. It's been 9 years and the grief at times is still just as bad as it was in the beginning. Don't let anyone every tell you that grief has a timetable. It doesn't. If you are having a bad day, then so be it. As you know, you never know when grief is going to hit you. It can come crashing down on you like a huge tidal wave. And you are still in your first year, which is the hardest as far as the raw feelings go. You will always miss your mom, you will always grieve for her. Be gentle with yourself. What you said about people not asking about how you're doing anymore...that is one of the hardest parts about the grief journey, I think. Phil's 9 year passing anniversary was just a few weeks ago - September 25th. It truly hurt me to the core when no one from my family nor two of my best friends in the area didn't contact me in any way that day. Not even a text to say "thinking of you". Just because it was 9 years does not mean that day was any easier on us than the 2nd or 3rd year, etc. In fact, it was just as bad. Me and my husband had a really hard time getting through the day. Again, thank you for sharing. I am sending you lots of love and a big hug. Melanie, I am so sorry for your loss. I know that every day since you lost Phil has to be difficult, how could it not be? But anniversaries are especially hard. I think most people are just so busy with their own lives they don't realize how much loss impacts our daily lives even after a number of years. Or they don't want to "upset" us so they don't reach out, thinking that it's better than way...I send you wishes for peace, my friend. And a giant hug, too. I felt that same way when my first husband died. People quit asking after a while. They go on with their lives oblivious to your pain, which is just beginning. I so understand what you're saying Kim. Kim, this is a beautiful post. I don't think one ever stops grieving someone they love...the passage of time just seems to make the loss more bearable and less raw. My dad has been gone a little over 2 years and I still hurt as though it were yesterday. The hubster lost his best friend in March and he still finds himself typing a text to him or dialing his number to chat...then he remembers and the pain starts all over again. I love the quote! Love and hugs to you! Kim, I'm so very touched by your thoughts about mourning the loss of your mother and also thoughts expressed in the comments, many by dear blog friends. We rarely know the pain others are feeling, do we? Maybe that's partly why we blog, to help us get through difficult days. It's good for all of us to read what you've written. I hope it's helped you in some small way to know that others do care and want you to tell us these heart things. And I remember so many things you've written about your mother that made a lasting impression on me. I believe that the happy memories will comfort you more and more as the years pass. Sending love, Dewena. Dewena, it's funny you said that about the blog...it's the reason I started writing. My mom was sick and life was changing quickly and I needed a positive, fluff filled outlet, so I started writing about DIY and crafts. Subjects of little consequence. Funny how the hard stuff makes its way in, isn't it? And yes, it has helped me tremendously. I hope that it has helped others as well, in some small way. Thank you for your insightful words. They really do make a difference. Yes - my mom has been gone for 13 years, she was only 69 and I still miss her. My Dad is 87 and is doing quite well, but I know that the time is coming for him too, and like you, I don't want to think about it! I'm sorry for your loss, Mari. It really doesn't get easier, but I suppose that's a testament to the love we still carry for them and how wonderful they were. Kim, so sad for you and my sympathies on your loss. I am around your age, and while my Mom is still living I know the day will come eventually, and I will miss her so badly. NO one knows you like she does and while we sometimes have been at odds I love & value her dearly & will sorely miss her. My Dad died 3 years ago , after a long suffering with Alzheimers and I miss his laugh, funny stories and laid back nature. IT is so hard to grow older, or even if younger, to lose one's parents. The pain lessens , but they are still missed. Thank you so much for your kind words and I'm so sorry for your loss. I miss those same things about my mom. And yes, no one know you or loves you like your mom does. I am blessed to be surrounded by loving family and friends, but sometimes you really do just want you mom...I really appreciate you taking the time to comment. The words really do help. Hoping you'll soon find peace. Its okay to still not be okay. Grief takes time and some levels of it we'll never get past. You know, as you've said, that it will get less searing, but it will always hurt. That's the hard/beautiful thing about love. You and your mother LOVED each other, you will always love her, and carry her love for you in your heart. I have prayed for you, when you've come to mind. You are not alone, God will never leave you or forsake you. Thank you for sharing your heart today. Deanna, thank you so much for the kind comment. You are right, we loved so much and that is why the grief is so deep. I am grateful for the lovely relationship we had and the many years we did have together. It was a blessing. And how touched I am to know have kept me in your prayers. What a very thoughtful and sweet thing to do...it means a lot. Honestly I think we all do this. We grieve silently because we don't want to be a difficult or needy person...at least that's what I do. My dad has been gone 34 years (37 since I actually heard him speak) & my mother has been gone 12 this December. I didn't really have great relationships with either one & I was actually more relieved than grieved when they passed away. Living life with each of them was just so very hard. But as I age & face the hard things we all face I especially think of my mother. The older I grow, the more I realize that no one really loves me as much as she did. I know I'm loved but it's easier to see my life(& hers) through her eyes as I age...to see love where in things that so frustrated me as I lived through them. So I think in a way I grieve more as time passes instead of less. Not very comforting....but I do believe it's a normal part of life. I think it is not that people are oblivious to your pain but more that it is such a private thing. No one can replace your mom or even help you really. It is something you must come to terms and learn to live with yourself. I lost my mom many years ago and no matter how much my friends tried to comfort me it was impossible. I went through this alone, and now that a close family member has passed I too am just as guilty of being unable to say anything besides the typical. Because there really are no words that can comfort you. Only you can live your life and remember her the best way you know how, with love in your heart. I am one of those people that just doesn't know what to say to someone after their loss, afraid to "trigger" the grief again. You have expressed your grief in this well written post so beautifully and I hope it helps to heal your heart a little. As a writer, it helps to get it all down on paper sometimes. Hugs to you! Thank you, AnnMarie. And trust me, I am that person myself sometimes. It's hard to know what to say, so there are times that I don't say anything either. As far as personal healing goes, the writing does help, I was hesitant to publish this one, but I'm glad I did now. It's comforted me and I hope it's provided some solace for others, as well. Thank you, Kim. So very true. I have struggled with loss as well the last few years. Memories that are triggered can be the real hard days. I wonder why do we all of a sudden have those memories flood back, sometimes not at convenient times, when we are suppose to be STANDING STRONG. Thank You, as always, well done. I didn't live near my mother who lived with my sister when she died. My sister's daily life changed, but mine did not. What I found in the first few years was that about 5 pm on a random night I would say to myself, "I need to call mom" because that was when I called her and then I would catch myself and ask why that thought had come to mind. Usually it was when something big was going on in my life and I knew she would want to know about it. It's been 17 years and the thought to call her happens rarely, but it still does. Thanks for sharing your touching post. I wish I could call my mom and tell her about our newly remodeled bathroom. She would love it. Carol, I do that all the time...I want to call her and tell her the good, the bad, the silly. I'm glad to hear I'm not alone. And I bet your mom would love your sweet new bathroom. It's fabulous! I can only send you a hug and let you know that there are others who feel the same. My Mom and Dad have been gone for 18 and 19 years ago, sometimes it was yesterday. My dad passed away five years ago - my daughter was 8 weeks old. I still have a draft on my phone of some baby pics I meant to send but didn’t. He passed away unexpectedly. The grief was my losses has changed me. I am an entirely different person because of it and through it my relationship with God deepened. That’s what had helped me - Him. A hug to you Kim and I am sorry for your loss. Thank you, Ronda, I'm sorry for your loss, as well. Sudden is terrible. No time to send those pictures or say goodbyes. I'm glad that you've found some solace, though. It's important to find something...or someone...that brings you a measure of peace. Oh honey... I know. It takes so long and it's such a hard road and no one seems to understand or get it until it happens to them. Even then they sit, just you are or I have, and feel alone with their pain. My best friend lost her husband 4 years ago and she gets told to get over it. How unthoughtful! If I ever heard anyone say that to her, I'd smack them right in the mouth, but of course they never do. Dammit! lol I wish I had some brilliant words to make you feel better. Just know that I do think of you and as always I wish I could hug you. I’m not exactly sure why Kim, but I feel very strongly that your mom and I would have been good friends. I bet she loved to dance, spoke her mind and didn’t suffer fools lightly. And of course, she raised a brilliant daughter. What’s not to like?! Instead of saying ‘I’m sorry’, I’m going to take a different stance. I’m going to tell you how blessed you have been to have the kind of love in your life that you’ve had and continue to have. Love never, ever dies, it just evolves and mellows and finds creative ways to be expressed. For some, it’s in simply speaking about our loved ones, for others it’s cooking their favorite recipe, and for you it’s writing about your feelings. It’s a gift you give yourself and others, and it’s a wonderful legacy to your mom. Doreen, I am so sorry that it’s taken me so long to respond to your comment. I don’t know what happened, but I blame it on a very full inbox…and a bit of a hard time confronting this topic. I love your take on it though…you are so right. I had the greatest mom, her love still supports me even though she physically cannot. It’s been hard this holiday season, I’m not going to sugar coat it. I miss her enormously, but she is everywhere I look ~ ornaments, my advent calendar, my recipes, songs on the radio and so much, much more. And I do believe you two would’ve totally hit it off. She did love dancing and didn’t suffer fools lightly. Your sense of humor and adventure, your love of travel and your very loving manner and kind words of friendship are just a few of the qualities you share.